Slowly but surely, we're getting back in to the swing of things at home after the holidays. Shaun was awesome enough to run a few errands for me this morning, so we have fruit again, which makes lunches much more appealing. We did have bananas and frozen fruits, but none of those look nice in bentos. And, I got my fruit just in time for this week's Muffin Tin Monday. The theme was cups and liners, so the perfect chance to break out some brand new silicone cups I bought before Christmas. They are from World Market and came in groups of 6. Of course, I had to by the blue stars and the pink flowers, couldn't leave one of my munchkins out! 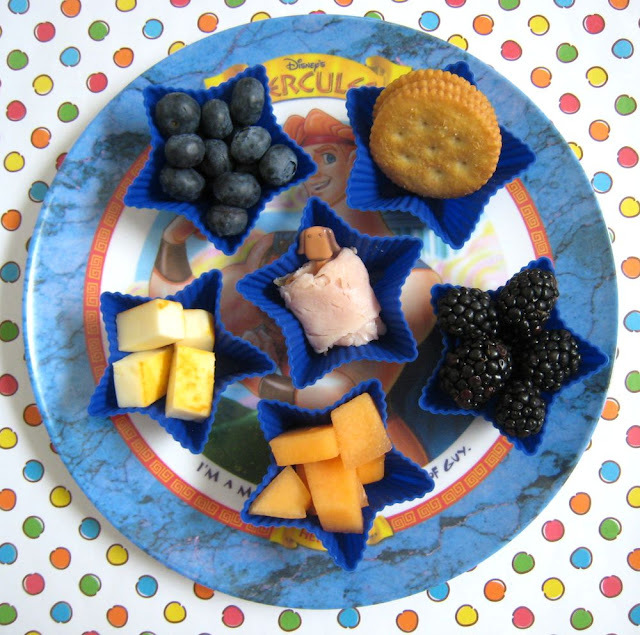 Ben has blueberries, blackberries, cantaloupe, muenster cheese, deli turkey and crackers today. Nothing fancy, the kids were "starving" and I wasn't feeling especially creative. Although, I learned that both of them apparently love muenster cheese, as they ate a half a block of it this afternoon. Faith's is similar, but no blueberries, and I am pretty sure Ben ate her blackberries (she is, oddly enough, not a berry fan). I added carrots to hers and got some poutiness that I did not want to cut the new cucumber just so she could have two slices right now. Sopapilla cheesecake - this is on my family/personal blog, but trust me, it is sooooo good! Cute presentation and very healthy choices. Yum! The cups are so cute! The fresh fruit looks awesome. Looks tasty, my lunch looked very similar today :D I love the cups they are so cute! my little boy LOVES his blue stars too! I have those exact silicone cups. They were such an awesome price. I wish they had a little more selection, but you can't beat the price. I also got the mini green ones and some orange flowers. Super cute cups! I wish I could find those near where I am...but that is what the internet is for - right? ;) I've decided that muenster cheese is the hidden treasure of the cheese world - kids and overly-picky adults like me rejoice! 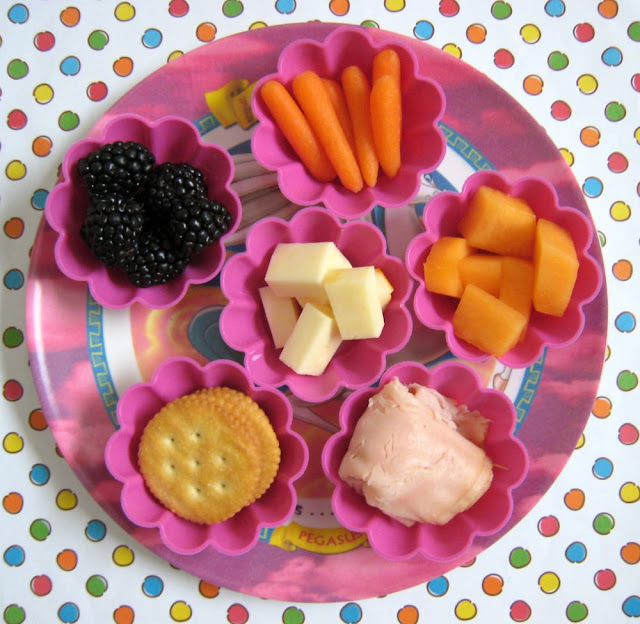 Super cute meals. Love the colors and balanced foods. I'm still kicking myself over giving all my Hercules plates to my sister, but I didn't have kids yet and we were clearing out our cupboards! Oh well! Everything looks so good! I love the blue stars! yup! I found these exact ones at Cost Plus a few months ago. Love them, and so do my girls.